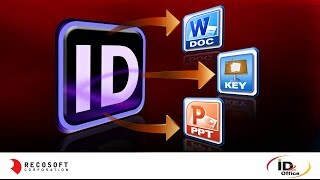 Illustrates ID2Office converting InDesign to PowerPoint and InDesign to Word files; using ID2Office you can easily export and convert InDesign files without having to recreate the contents in Word or PowerPoint. 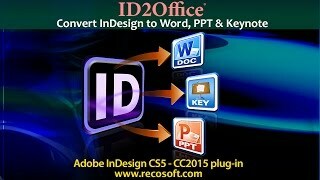 Today, we want to introduce how you can convert InDesign documents to editable Word and PowerPoint files using ID2Office; the InDesign-to-Office formats conversion tool from Recosoft. ID2Office is a plug-in for InDesign and supports InDesign CS5 through CS6 for both the Mac and Windows platforms. Once the plug-in is installed you get a Recosoft menu in InDesign with the “ID2Office – Export to Office format” command. To convert an InDesign file to Word or PowerPoint type you need to have an Open and saved InDesign file and use the “ID2Office – Export to Office format” command from the Recosoft menu. Lets export the document we have opened to the Word type. So we select the ID2Office – Export to Office format command. Immediately an ID2Office – Options window appears with in InDesign. The ID2Office Options window allows you to make settings to fine-tune the InDesign to Office formats conversion. We’ll get to the settings a little later. For now lets export the InDesign file to the Word format and observe the results. We see that you can specify whether you want to export to the Word or PowerPoint format. As Word is selected by default we just need to click “Export” in this case. We now see the “ID2Office Export window where we get to name the file. Lets just name it MyTest and click Save. 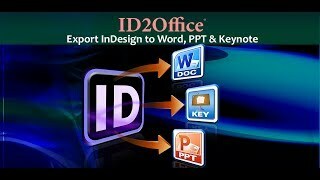 ID2Office will spend some time analyzing the document and it will go through the process of creating a Word (or PowerPoint as it may be) file. We see that the export is complete and ID2Office informs you once its finished. Let open up the exported file and compare it to the original InDesign file. We notice how the layout is well preserved, with the paragraphs properly formed, table properties appropriately applied and graphics objects being embedded as expected. There is no need to recreate the document from scratch, which saves you valuable time. Now, lets explore the various settings available in the ID2Office – Options window. Lets switch to a different InDesign document and bring up the ID2Office – Options window using the “ID2Office – Export to InDesign” command. We’ve already learned that we can specify to export the file either to the Word or PowerPoint formats. As we explore the setting we observe that we get to specify the image type that the graphics should be converted to and we can even specify the resolution. Moving down we see “Format Tables to be exact size”. Tables in Word and PowerPoint are not exactly the same as tables in InDesign; by having this option set, the table dimensions are formatted exactly as InDesign tables. Then we have “Set White area as Transparent in images”. InDesign allows you to apply some neat transformations to graphics such transparencies and other effects. A lot of these effects aren’t available in Word or PowerPoint; thus by turning on this option the “white” area of graphics becomes transparent in the resulting Word or PowerPoint file; and that the background colors can seep through; retaining the look and feel of the original InDesign file. Moving further down we have Convert linked frames to Office-style linked frames. When ID2Office exports to the Word format it maintains the layout by converting InDesign frames to Word text frames. During this process, if this setting is on it ensures that frames that are threaded in InDesign are threaded in the Word document. We then have “Convert style sheets to Office style sheets”. This setting guarantees that InDesign character and paragraph style sheets are propagated to the resulting Word file. Further down we have “Exclude Hidden Layers”. When this is set, Hidden Layers in the InDesign document are ignored and not processed when converting to the Word or PowerPoint formats. Than we have “Convert Page Transitions to Office Transitions”. This setting is only effective when converting to the PowerPoint format; basically InDesign Page transitions that have been applied will be converted to equivalent PowerPoint page transitions. Next we have “Process and apply shadow”. When this is set the drop shadow property is processed. When converting to the PowerPoint format you can further specify whether the shadow property should be an inner or outer shadow. Finally we have the “When converting paragraph line spacing” which allows you to specify how line spacing should be treated. In InDesign every line can have a different spacing within a paragraph; but that’s not possible in Word or PowerPoint. Thus, you have control over the line spacing characteristics via the line spacing list. You can choose from 4 values as you can see. Lets now Export to the PowerPoint format and observe the results. We select PowerPoint as the format to export to and click “Export”. Then we give the file a name and click Save. As ID2Office processes that document it creates the final PowerPoint file in a short time. Lets observe the quality of the conversion. You notice that the layout is very well maintained and the Text/Graphics are also readily editable. ID2Office provides a lot of control when exporting and InDesign file to the Office formats for you to achieve the best conversion result.